Under patronage of the Municipal centre of information and culture Krnov, together with Ministry of Culture, under the patronage of town major of Krnov, the Kino Mir 70 theatre will again be the meeting point for film enthusiasts from not only the Czech Republic but also visitors from many European counties, including Austria, Denmark, France, Germany, Holland, Poland, United Kingdom and the United States. The event is organized in collaboration with town Krnov, supported by the Ministry of Culture of the Czech Republic. The 70mm cinema Mír 70 in Krnov is one of very few cinemas in the four Visegrad countries (Czech Republic, Slovakia, Poland and Hungary), which is able to screen 70mm film of the original, six-track magnetic stereo sound to 105 square meters of slightly curved screen (also with full digitali projection). One of the main task of the festival is to recall the now unused film format which dazzled visitors in its time by brilliant display of details in picture and and insurmountable sound to nowadays public - DESPITE ALL THE DRAWBACKS THAT OLD AND WORN-OUT COPIES OF 70mm FILMS BRING. The "Kino Mir 70" was built around 1920 and is one of the few few cinemas left in The Czech Republic with 70mm projection equipment. The building is owned by the local county and they rent it to the city. It is now managed, with great enthusiasm, by Mr. Pavel Tomešek. From the outside, two sets of doors lead into the cinema and its magnificent and spacious foyer. Original title: LE GRAND BLEU / THE BIG BLUE – 118 min (edited version). Country of origin: France-US, 1988, César Awards. Filmed in: Moviecam Cameras, 70mm 1:2,2 blow-up. Print: Vintage print. Presented as: 6-track magnetic Dolby Stereo A, original version, Czech subtitles. Released in CSFR: 1.5.1991 in 35mm. Kino Mir 70 premiere: 25.6.1991. Screenings: 10. Guests: 219. 70mm premiere in Czech republic: April 2015 on annual 10th Krrr! 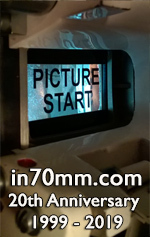 They are doing a marvellous job at the Kino Mir 70 keeping the best movie experience alive by waving the 70mm flag with. On the second floor, the staircase splits, leading up to the two entrances into the cinema. I enter from the rear of the cinema, and behold: a very nicely sloped cinema. Walls, carpets, seats and curtains are green. Original title: VERTIGO – 128 min. Country of origin: US, 1958, César Awards. Filmed in: Mitchell VistaVision Cameras (35mm horizontal). Print: full colours. Restored in 1996 and released on 70mm, 1:1,85 (flat). Presented as: Digital 6-track Datasat stereo, original version, Czech subtitles. Released in Czech republic: 15.2.1998 only on 35mm under the patronage of art Project 100. Kino Mir 70 premiere: 25.6.1991. Screenings: 1. Guests: 15. 70mm premiere in Czech republic: April 2015 on annual 10th Krrr! "Size always Matters - The Early Days of Todd-AO" Illustrated lecture by Thomas Hauerslev about what happened from 1952 until the premiere of "Oklahoma!" in 1955. The story about how Todd-AO was developed by American Optical Company. Run time about 45 minutes. • Miramax Films Presents "El Cid"
Original titel: Jesus Christ Superstar / USA 1973. Filmed in 35mm Todd-AO 35 Anamorphic (2,39:1). Presented in 70mm (2,20:1) / 6 track magnetic stereo. 108 minutes / Original premiere print. US premiere: 07.08.1973. original version, Czech subtitles. Never released in Czechoslovak film distribution. 70mm premiere in Czech republic: April 2015 on annual 10th Krrr! “Terminator 2 - Judgement Day” (2:17). Filmed in: 35mm, 24 frames per second. Principal photography in: Panavision Super 35. Presented: On the curved screen with 6-track Dolby Stereo SR, format 43, original version, Czech subtitles. Aspect ratio: 2,21;1. Country of origin: USA. Production year: 1991. World Premiere: 01.07.1991, USA. Czeck premiere: 6.3.1992. Kino Mir 70 premiere: 17.4.1992. Screenings: 8. Guests: 1928. 70mm premiere in Czech republic: 3.4.2009 on 4th Krrr! Print: Good condition, full colour balance. 10:10 "The Wild Bunch" (134 min) Filmed in: 35mm 4 perforations, 24 frames per second. Principal photography in: Panavision. Presented on the curved screen in an original blow up 70mm print with 6-track magnetic Stereo. Czech subtitles. Aspect ratio: 2,21:1. Country of origin: USA. Production year: 1969. Originally premiered 29. January 1970, Warner, London, England. Released in CSFR: 1.7.1991, in 35mm. Kino Mir 70 premiere: 8.10.1992. Screenings: 6. Guests: 286. 70mm premiere in Czech republic: April 2015 on annual 10th Krrr! Producer: Phil Feldman. Director: Sam Peckinpah. Photography: Lucien Ballard. Music by: Jerry Fielding. William Holden (Pike Bishop), Ernest Borgnine (Dutch Engstrom), Robert Ryan (Deke Thornton), Edmond O'Brien (Freddie Sykes), Warren Oates (Lyle Gorch).